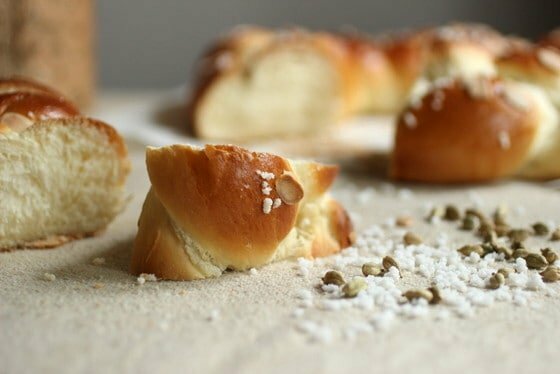 Festive breads is something that’s always on my end-of-the-year bucket list, but sadly for them, they hardly ever get made. Blame it on the hectic month of December, which here includes hot days and almost there summer vacations. So I’m glad I made today’s Tuesday with Dorie recipe. The contributing baker is Beatrice Ojakangas. Now, if you never heard of her it’s fine. But if you never made her quick danish dough recipe you really should. Really. No kidding. You should make danish with her recipe, it’s amazing. Back to our bread, I love scandinavian baked things. They usually have cardamom, which is one of my favorite spices, ever since I discovered whole pods. The fragrant, lemony, intense aroma of just ground cardamom is an experience in itself. The flavor after baking is sweet and unique. 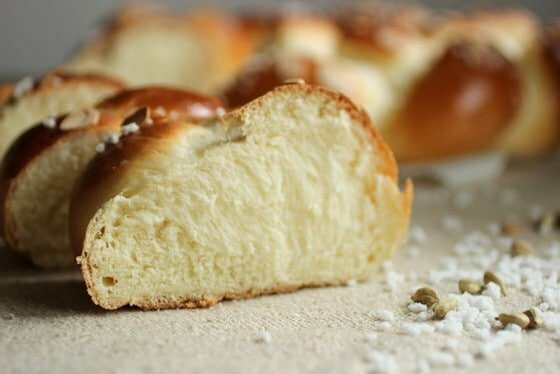 This is a brioche like dough, enriched with eggs and butter. Easier to make and much more gentle on your stand mixer since it doesn’t need to knead it for so long you’re afraid it might just explode, as it does with brioche. The butter is melted before adding, very nice, it makes for a silky smooth dough. Then comes an interesting part which involves oiling the work surface in order to work easily when braiding the bread. This is a round braided loaf, so the three strands have to be very long. 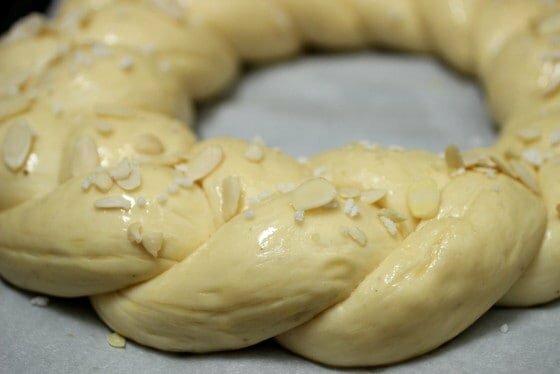 But man, that oiled dough is a marvel to work with, the strands get braided in no time, there’s no messy adhering of dough to the counter and it’s quite easy to maintain the shape of the whole thing. After all, it’s almost Christmas, we want our breads to look pretty. Don’t we? Though my braids will always be irregular. It’s just my style. or so I tell myself. There was a bow involved, to put over both overlapping ends of the circle to cover it, which I didn’t do. I just added some extra pearl sugar and almonds there before baking. And the pic in the book, Baking with Julia, doesn’t have a bow. Or I can’t find one. So I’m going with that. Bow or no bow, this bread is quite a magnificent thing. It comes out of the oven all puffed and golden, the kind of bread that attracts looks. 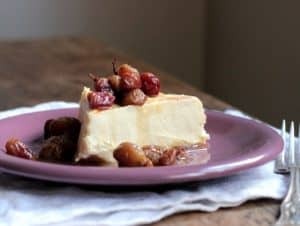 I went from almost not making this recipe today to not only posting it, but also the ideas of working with it are making quite a long line in my mind. It’s a not-too-sweet, easy to work with, perfect for so many additions, and quite-fast-to-make dough, considering there’s no overnight fridge sleepover like brioche. 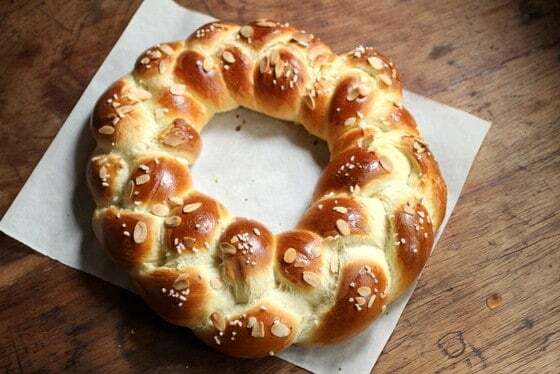 It’ll make a good King’s Wreath or Easter Bread, a sweet bread made here on jan 6 and Easter time. They are supposed to be different, but usually one type works for both occasions. The host today is Erin, of The Daily Morsel. 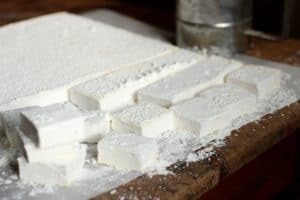 She has not only the full recipe, but also posted wonderful step-by-step pics of the whole process. I really urge you to try it. It’s that good. Just gorgeous, Paula! Your post looks like a magazine spread! Gorgeous! I loved this one. I liked that it was flexible enough to rise in the fridge. We'll be making it again! Paula, your bread looks great! I might just need to look into that danish recipe. My husband is a huge fan of good danishes. Gorgeous looking bread, Paula! I froze mine to save for Christmas morning…can’t wait to give it a try! 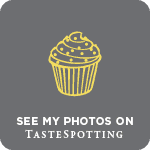 Your photos are so lovely! Happy Tuesday! Cardamom and fresh bread together is the best thing I've seen all day. Paula, wonderful photography and a gorgeous looking Finnish dessert bread – the wreath looks so professionally done, it is just perfect. 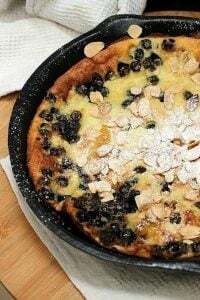 The cardamom was a delicious addition to the dough and the toppings of both the pearl sugar and the slivered almonds were just the rught pretty and delicious last touch. Fabulous post! Beautiful bread Paula! I'm definitely a fan of Northern Europe's breads (as you know), and cardamom makes them so flavorful. I completely agree about the spice, taking in its scent is an experience in itself. I think your braid looks lovely. This bread has just the right balance of sweetness, softness, and flavour. as always, i am supremely in awe of anyone who can make bread, paula! your pictures – the bread looks moist and fluffy and lovely. 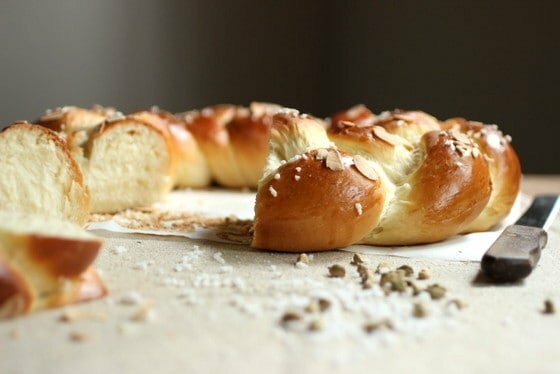 Your Finnish Pulla looks great! Definitely a keeper to make in different times, with different flavors!!! Looks great.. I would like it with milk! Gorgeous. I guess we both had the same mind set today. 🙂 Was so tempted to make it round, but had to follow the recipe. Beautiful & happy holidays! Just lovely! 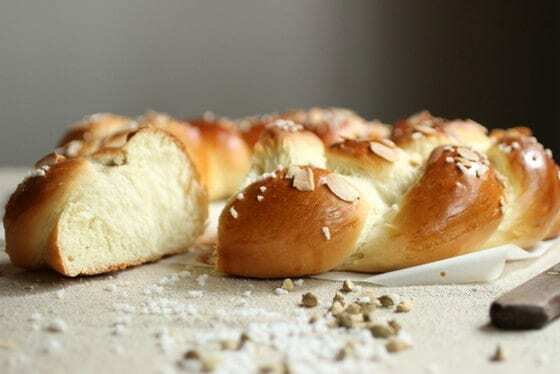 The Finnish Pulla is a stunner, well done! 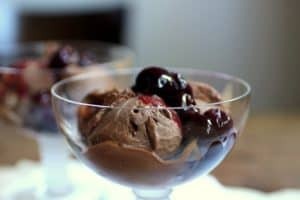 December is a month with too many recipes to try and never enough time! Gorgeous photos! I think your braid looks absolutely perfect. 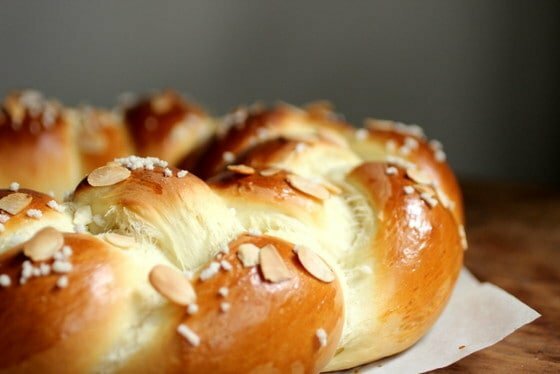 Thanks for the link to the Danish braid as that looks yummy too! Those are some lovely photos and your braid does look perfect! Well done on the delicious looking bread! I had a bit of trouble with the bow and you are right, there is no bow in the book! Lovely job on this wreath! 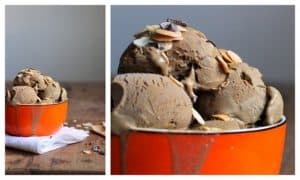 Cardamom is definitely a good thing! Fabulous looking pulla. I love your photos…they're wonderful. I look forward to trying this bread again and again. Acabo de sacar el pulla del horno. Lo voy a repetir ! Es exquisito y el paso a paso facilita muchísimo la tarea. Me encanta que lo hiciste! Esta receta es un hallazgo, hace rato que no me entusiasmo tanto con un pan nuevo. Hay que repetirlo! Totalmente de acuerdo con la repetición! So so pretty! I need to make it again and get the braiding right! Oh, and make that danish recipe!